SNUBBED by Germany for the World Cup, Leroy Sane also had to deal with being dropped entirely from Manchester City's squad early in the Premier League season. How quickly things have turned round for the flying winger: Back in favour for club and country, he cannot stop scoring. 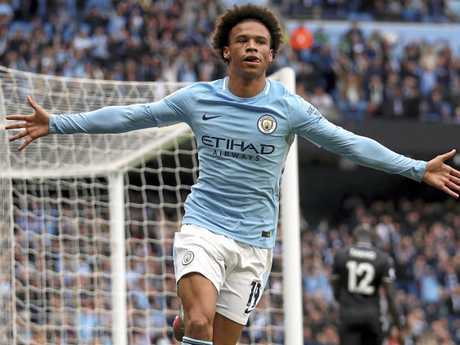 Sane chested in City's opening goal in a 2-1 win over Watford on Wednesday, a seventh straight victory in the Premier League that left the defending champions five points clear. They are unbeaten after 15 games of the 38-match campaign. Since returning from the international break where he scored in back-to-back games for Germany, Sane has netted three goals in three league matches for City. He has seven goals in his last 10 games combined for Germany and City. In a period when City manager Pep Guardiola is heavily rotating his squad, Sane remains a constant in the starting line-up - but it's not just down to his superb form. With left back Benjamin Mendy likely out for another two months because of a knee injury, Sane is the only other player to give City genuine width on that flank. 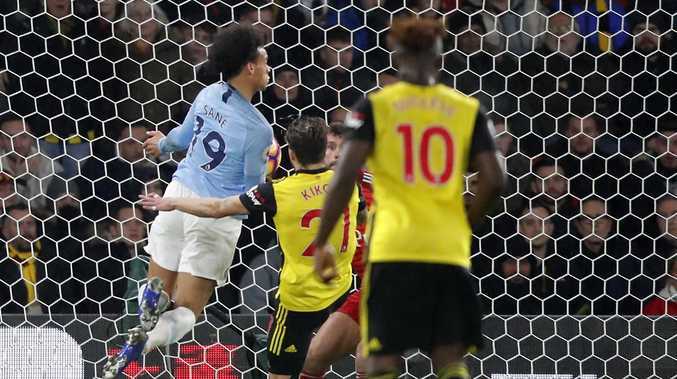 Riyad Mahrez swung in the cross for Sane's 40th-minute goal, in which he improvised by using his chest to direct the ball between the legs of Watford goalkeeper Ben Foster. Then Mahrez, starting ahead of Raheem Sterling on the right wing, doubled the lead after converting a cross from Gabriel Jesus. City weathered a late fightback from Watford, which reduced the deficit in the 85th through Abdoulaye Doucoure's scrambled effort and then pumped many balls into the box in an attempt to force an equaliser. A first-half injury to star forward Marko Arnautovic was the last thing West Ham wanted in its match against Cardiff. 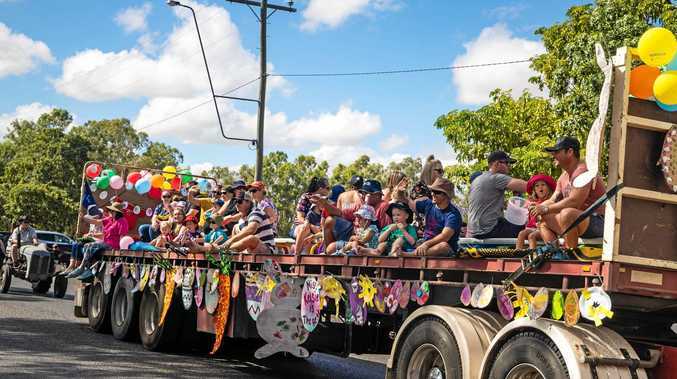 It proved to be a game-changer in a way few of the home fans could have imagined. 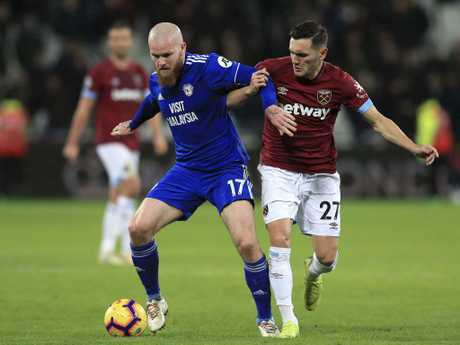 Lucas Perez came on as the replacement for Arnautovic in the 38th minute, and scored twice early in the second half to set West Ham on its way to a 3-1 win at the Olympic Stadium. Michail Antonio scored the other goal for the hosts. Cardiff, which had a penalty saved in the first half, scored a consolation through Josh Murphy. The win moved West Ham into 12th place. Callum Wilson and Ryan Fraser set each other up for goals as Bournemouth ended its four-game losing streak in the league with a 2-1 win over Huddersfield. It moved the small south-coast team above Manchester United into sixth place. Bournemouth had to work hard to see out the win after Terence Kongolo pulled a goal back with a header shortly before the break for Huddersfield, which is one place and one point above the relegation zone. Wilson has scored eight goals in 15 league appearances this season, matching his career-best tally from last season in 13 games fewer. The striker's form earned him a call-up to the latest England squad. Even with only 10 players, Brighton was too good for fierce rival Crystal Palace. Brighton shrugged off the 28th-minute dismissal of center back Shane Duffy to ease to a 3-1 home victory for a second win in four days that moved the team into the top 10. Duffy was given a straight red card for thrusting his head into Palace defender Patrick van Aanholt, with Brighton 1-0 ahead at that stage through Glenn Murray's penalty. The hosts stretched their lead to 3-0 before halftime thanks to goals by Leon Balogun and Florin Andone. Palace's consolation goal came from Luka Milivojevic's penalty.